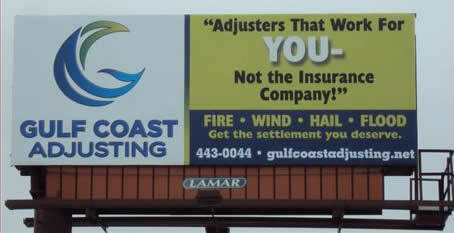 Gulf Coast Adjusting provides Public Insurance Adjusting services throughout the States of Louisiana, Mississippi, and New Jersey. Our typical clients include Homeowners, Business Owners, Commercial Property Owners, Condominium Owners, Condominium Associations, and Apartment Complex Owners. Gulf Coast Adjusting also provides professional estimating and expert services for legal and engineering firms. Rich is the founding member of Gulf Coast Adjusting, and enjoys over 15 years of working in the construction and insurance industries. Rich has been continually licensed by the State of Louisiana # 508253 and State of Mississippi # 10180259 and the State of New Jersey #1513282 as a Public Adjuster. Rich is proficient with insurance industry leading estimating software Xactimate and Xactcontents. Rich is an admitted expert in the field of Claims Damage Estimating in Federal Court in the Eastern District of Louisiana. Rich achieved Journeyman Carpenter status through apprenticeship, and worked as a Journeyman Carpenter for The Michigan Regional Council of Carpenters, a subchapter of the United Brotherhood of Carpenters and Joiners of America for a total of 7 years. In his time with the MRCC, Rich enjoyed his work on residential homes, apartment complexes, commercial shopping malls and various commercial buildings, hotels, public schools, Detroit Metro Airport (McNamara Terminal - Northwest World Gateway), Beaumont Hospital (Troy, MI), Life Science Institute (University of Michigan, Ann Arbor, MI), Biomedical Engineering Center (University of Michigan, Ann Arbor, MI), Oakland County Court & Jail Complex (Oakland County, MI). During that time and independently, Rich became licensed as a residential contractor, MI license #2101178816. Rich was given the opportunity to apply his construction knowledge to the insurance industry, and soon found his passion in Public Insurance Adjusting. Hurricane Katrina and close ties to New Orleans brought Rich to the Gulf Coast in 2005, and Rich has made his home in the New Orleans area to present date. Danielle came to Gulf Coast Adjusting in June 2012. She has 18 years of experience in the insurance industry. Danielle's background includes 15 years with State Farm Insurance handling Catastrophe Claims, NFIP Flood Claims, Large and Complex Residential and Commercial Claims, Complex Condominium Association, Townhome and Apartment claims, Business Interruption, Fraud Investigation, Subrogation and Propert/Casualty Sales. She has settled claims in Louisiana, Mississippi, Arkansas, Oklahoma, Missouri and Michigan. In her last year with State Farm's Complex and Large Loss Unit, Danielle wrote and settled more than $8 million in claims for State Farm insurance using the industry standard Xactimate estimating system. Danielle has served as an expert witness on property claims, successfully testifying in court regarding structural damages. Danielle is or has been a member of The International Association of Arson Investigators (IAAI), the Louisiana Association of Arson Investigators (LAIAAI), the International Association of Special Investigative Units (IASIU), the International Association of Special Investigative Units Louisiana Chapter, The Fraternal Order of the Blue Goose, The Louisiana Claims Association, and a Board Member of Habitat For Humanity. Danielle has given Claim, Fire and Fraud Prevention presentations in many different venues including The National Center for the Prevention of Home Improvement Fraud, State Farm Agency and Management Meetings, Philanthropic Educational Organization (PEO) meetings and many more. She is available for Hurricane Preparedness, Claim, Fire and Fraud Prevention presentations for neighborhood, Townhome and condominium associations, fraternal organizations, professional organizations, and more. Danielle earned a Bachelor's Degree of Science from Lake Superior State University in Sault Ste. Marie, Michigan and a Juris Doctorate degree from Capital University Law School in Columbus, Ohio. Danielle is a licensed Public Adjuster and Appraiser in Louisiana, license number 433970. She is also a licensed Public Adjuster and available as an appraiser in Mississippi, license number 10279190. Danielle is married to Baton Rouge native Charles Voss. Charles is the Electrical Engineering Manager for CB&I (formerly Shaw) in Baton Rouge, Louisiana. They have two beautiful daughters and reside in Baton Rouge, Louisiana. Gulf Coast Adjusting also features a number of dedicated individuals working in harmony to bring the best possible experience to each of our customers. We welcome any type of covered loss and are committed to providing excellent service.